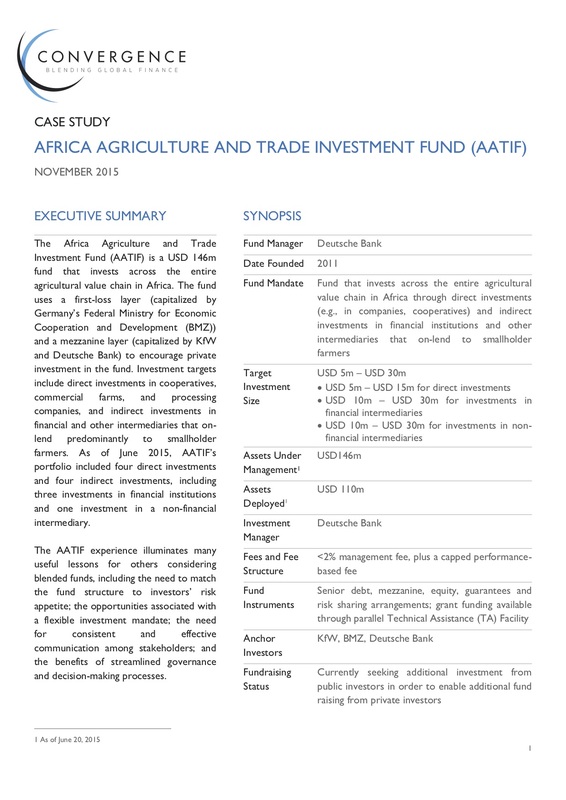 The Africa Agriculture and Trade Investment Fund (AATIF) case study details AATIF, a USD 146m fund that invests across the entire agricultural value chain in Africa. The fund uses a first-loss layer (capitalized by Germany’s Federal Ministry for Economic Cooperation and Development (BMZ)) and a mezzanine layer (capitalized by KfW and Deutsche Bank) to encourage private investment in the fund. The AATIF case study experience illuminates many useful lessons for others considering blended funds, including the need to match the fund structure to investors’ risk appetite, the opportunities associated with a flexible investment mandate, the need for consistent and effective communication among stakeholders, and the benefits of streamlined governance and decision-making processes.